The Gateway Arch serves as the attraction's centerpiece. Gateway Arch National Park, formerly known as the Jefferson National Expansion Memorial until 2018, is an American national park located in St. Louis, Missouri, near the starting point of the Lewis and Clark Expedition. The Gateway Arch and its immediate surroundings were initially designated as a national memorial by executive order on December 21, 1935, and redesignated as a national park in 2018. The park is maintained by the National Park Service (NPS). the debate over slavery raised by the Dred Scott case. The national park consists of the Gateway Arch, a steel catenary arch that has become the definitive icon of St. Louis; a 91-acre (36.8 ha) park along the Mississippi River on the site of the earliest buildings of the city; the Old Courthouse, a former state and federal courthouse where the Dred Scott case originated; and the 140,000 sq ft (13,000 m2) museum at the Gateway Arch. The Gateway Arch, known as the "Gateway to the West", is the tallest structure in Missouri. It was designed by Finnish-American architect Eero Saarinen and structural engineer Hannskarl Bandel in 1947 and built between 1963 and October 1965. It stands 630 feet (192 m) tall and 630 feet (192 m) wide at its base. The legs are 54 feet (16.5 m) wide at the base, narrowing to 17 feet (5.2 m) at the arch. There is a unique tram system to carry passengers to the observation room at the top of the arch. The Old Courthouse is built on land originally deeded by St. Louis founder Auguste Chouteau. It marks the location over which the arch reaches. Its dome was built during the American Civil War and is similar to the dome on the United States Capitol which was also built during the Civil War. It was the site of the local trials in the Dred Scott case. The courthouse is the only portion of the memorial west of Interstate 44. To the west of the Old Courthouse is a Greenway between Market and Chestnut Streets which is only interrupted by the Civil Courts Building which features a pyramid model of the Mausoleum of Mausolus (which was one of the Seven Wonders of the Ancient World) on its roof. When the Civil Courts building was built in the 1920s, the Chouteau family sued to regain the property belonging to the Old Courthouse because it had been deeded in perpetuity to be a courthouse. Underneath the arch is a visitor center, entered from a circular entryway facing the Old Courthouse. Within the center, a project to rebuild the Museum at the Gateway Arch was completed in July 2018. The new museum features exhibits on a variety of topics including westward expansion and the construction of the arch, all told through a St. Louis lens. Tucker Theater, finished in 1968 and renovated 30 years later, has about 285 seats and shows a documentary (Monument to the Dream) on the arch's construction. A second theater was added in 1993 but removed in 2018 as part of the CityArchRiver renovation project. Also located in the visitor center are a gift shop and cafe. The memorial was developed largely through the efforts of St. Louis civic booster Luther Ely Smith who first pitched the idea in 1933, was the long-term chairman of the committee that selected the area and persuaded Franklin Roosevelt in 1935 to make it a national park service unit after St. Louis passed a bond issue to begin building it, and who partially financed the 1947 architectural contest that selected the arch. In the early 1930s the United States began looking for a suitable memorial for Thomas Jefferson (the Washington Monument and the newly built Lincoln Memorial were the only large Presidential memorials at the time). Shortly after Thanksgiving in 1933 Smith who had been on the commission to build the George Rogers Clark National Historical Park in Indiana, was returning via train when he noticed the poor condition of the original platted location of St. Louis along the Mississippi. He thought that the memorial to Jefferson should be on the actual location that was symbolic of one of Jefferson's greatest triumphs—the Louisiana Purchase. The Battle of Saint Louis, the only battle west of the Mississippi River in the American Revolutionary War. The first capital of Upper Louisiana for the United States, the Louisiana Purchase north of the 33rd parallel that was the original Louisiana Territory in 1803. The Three Flags Day ceremony in 1804 in which Spain formally turned over Louisiana to France, less than 24 hours before France then officially turned it over to the United States. This technically completed the Louisiana Purchase, and also cleared the way for Meriwether Lewis and William Clark to legally begin their exploration of the continental west, which Spain had prohibited. Almost all of the historic buildings associated with this period had been replaced by newer buildings. His idea was to raze all of the buildings in the original St. Louis platted area and replace it with a park with "a central feature, a shaft, a building, an arch, or something which would symbolize American culture and civilization." Smith pitched the idea to Bernard Dickmann who quickly assembled a meeting of St. Louis civic leaders on December 15, 1933 at the Jefferson Hotel and they endorsed the plan and Smith became chairman of what would become the Jefferson National Expansion Memorial Association (a position he would hold until 1949 with a one-year exception). The Commission then defined the area, got cost estimates of $30 million to buy the land, clear the buildings and erect a park and monument. With promises from the federal government (via the United States Territorial Expansion Memorial Commission) to join if the City of St. Louis could raise money. The area to be included in the park was bounded by the Eads Bridge/Washington Avenue on the north and Poplar Street on the south, the Mississippi River on the east and Third Street (now Interstate 44) on the west. The Old Courthouse, just west of Third Street, was added in 1940. The only building in this area not included was the Old Cathedral, which is on the site of St. Louis first church and was opposite the home of St. Louis founder Auguste Chouteau. The founders of the city were buried in its graveyard (but were moved in 1849 to Bellefontaine Cemetery during a cholera outbreak). 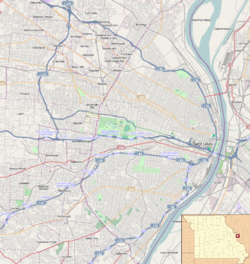 Taking away 40 blocks in the center of St. Louis was bitterly fought by some sources—particularly the St. Louis Post-Dispatch. On September 10, 1935, the voters of St. Louis approved a $7.5 million bond issue to buy the property. Local architect Louis Le Beaume provided a preliminary design proposal for the site that included multiple museums, fountains, and obelisks. The buildings were bought for $7 million by the federal government via Eminent domain and was subject to considerable litigation but were ultimately bought at 131.99 percent of assessed valuation. Roosevelt inspected the memorial area on October 14, 1936 during the dedication of the St. Louis Soldiers Memorial. Included in the party was then Senator Harry S. Truman. The land was to be cleared by 1942. Among the buildings razed was the "Old Rock House" 1818 home of fur trader Manuel Lisa (now occupied by the stairs on the north side of the arch) and the 1819 home of original St. Louis pioneer Jean Pierre Chouteau at First and Washington. The architectural competition for a monument was delayed by World War II. Interest in the monument was fed after the war as it was to be the first big monument in the post-World War II era. The estimated cost of the competition was $225,000 and Smith personally donated $40,000. Civic leaders held the nationwide competition in 1947 to select a design for the main portion of the Memorial space. Architect Eero Saarinen won this competition with plans for a 590-foot (180 m) catenary arch to be placed on the banks of the Mississippi River. However, these plans were modified over the next 15 years, placing the arch on higher ground and adding 40 feet (12 m) in height and width. The central architectural feature at the base of the arch is the Old Courthouse, which was once the tallest building in Missouri and has a dome similar to the United States Capitol and was placed on the building during the American Civil War at the same time as that on the U.S. Capitol. Saarinen developed the shape with the help of architectural engineer Hannskarl Bandel. It is not a pure inverted catenary. Saarinen preferred a shape that was slightly elongated and thinner towards the top, a shape that produces a subtle soaring effect, and transfers more of the structure's weight downward rather than outward at the base. When Saarinen won the competition, the official notification was sent to "E. Saarinen", thinking it to be the architect's father Eliel Saarinen, who had also submitted an entry. The family celebrated with a bottle of champagne, and two hours later an embarrassed official called to say the winner was, in fact, the younger Saarinen. The elder Saarinen then broke out a second bottle of champagne to celebrate his son's success. Among the five finalists was local St. Louis architect Harris Armstrong. Land for the memorial was formally dedicated on June 10, 1950 by Harry S. Truman. However the Korean War began and the project was put on hold. On June 23, 1959, work begins on covering railroad tracks that cut across the memorial grounds. On February 11, 1961, excavation began, and that September 1, Saarinen died. On February 12, 1963, the first stainless steel triangle that formed the first section of the arch was set in place on the south leg. On October 28, 1965, it was completed, costing approximately $15 million to build. The adjacent park was designed by landscape architect Dan Kiley. Along with all other historical areas of the National Park Service, the memorial was listed on the National Register of Historic Places on October 15, 1966. Vice President Hubert Humphrey and Secretary of the Interior Stewart Udall dedicated the arch on May 25, 1968. In 1984, Congress authorized the enlargement of the Memorial to include up to 100 acres (40 ha) on the east bank of the Mississippi River in East St. Louis, Illinois. Funds were authorized to begin land acquisition, but Congress placed a moratorium upon NPS land acquisitions in fiscal year 1998. The moratorium continued into the 21st century, with expansion becoming less likely because of the construction of a riverboat gambling facility and related amenities. During the Great Flood of 1993, Mississippi flood waters reached halfway up the Grand Staircase on the east. In 1999, the arch tram queue areas were renovated at a cost of about $2.2 million. 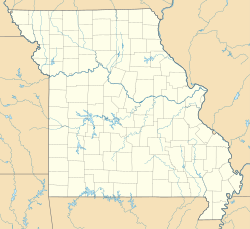 As well, the Ulysses S. Grant National Historic Site in St. Louis County, Missouri, was put under the jurisdiction of the Superintendent of the Memorial. The arch was featured on the Missouri state quarter in 2003.
replacing the north garage with an outdoor amphitheater, an explorers garden for children and an addition of 7.5 acres of green space. an expanded museum below the Gateway Arch with a new western entrance nearly a block closer to downtown than the original entrances. The entire project is now scheduled for a 2018 completion, an update to Kiener Plaza due in 2017, completion of the new museum in 2018 and improvements to the Old Courthouse ending the work. In 2016, many ash trees on the grounds were removed to preempt damage from emerald ash borers. Prior to the work of CityArchRiver, there were 1,800 trees on the grounds. There are now a total of 4,200. The $380 million project was funded both privately and publicly. The public funding, provided largely by Proposition P, totaled $159 million. The remaining $221 were secured via fundraising efforts of Gateway Arch Park foundation. The United States Congress approved the Gateway Arch National Park Designation Act in early 2018 to re-designate Jefferson National Expansion Memorial as Gateway Arch National Park. U.S. President Donald Trump signed the act into law on February 22, 2018. ^ "NPS Annual Recreation Visits Report". National Park Service. Retrieved March 7, 2019. ^ "Luther Ely Smith: Founder of a Memorial" (PDF). The Museum Gazette. National Park Service. Retrieved January 11, 2008. ^ O’Neil, Tim (December 13, 2012). "With cornice repairs complete, scaffold around St. Louis' Old Courthouse coming down". St. Louis Post-Dispatch. ^ "St. Louis River Front Memorial Approved by Voters". The Southeast Missourian. September 11, 1935. Retrieved November 10, 2016. ^ "St. Louis Landmarks". genealogyinstlouis.accessgenealogy.com. Archived from the original on April 7, 2008. Retrieved January 11, 2008. ^ Salter, Jim (August 29, 2007). 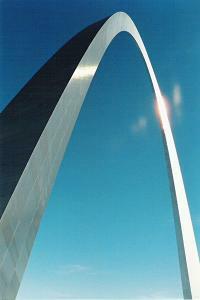 "St. Louis hopes to obtain part of Arch grounds". Southeast Missourian. Archived from the original on June 28, 2018. Retrieved April 20, 2017. ^ "City Leaders Pitch Local Control of Arch Grounds". St. Louis Post Dispatch. August 29, 2007. Archived from the original on January 31, 2008. ^ Bomar, Mary A. (August 2007). "Summary of Park Centennial Strategies" (PDF). National Park Service. Retrieved February 15, 2008. ^ "เว็บไซต์แทงบอลออนไลน์ชั้นนำ ตื่นเต้นกับ sbobet maxbet ibcbet คาสิโนออนไลน์อย่างครบครัน – กับลิงค์ทางเข้า sbobet ที่เข้าง่าย แทงบอลได้อย่างสะดวกสบายตลอดเวลา 24 ชั่วโมง". Cityarchrivercompetition.org. January 27, 2016. Retrieved July 16, 2016. ^ Barr, Diana (September 15, 2015). "Gateway Arch grounds renovations fall further behind schedule". St. Louis Business Journal. Retrieved June 22, 2017. ^ "Gateway Arch museum delayed until summer 2018". KMOV.com. June 21, 2017. Retrieved June 24, 2017. ^ "New York firm MVVA wins Arch design competition | Metro". stltoday.com. September 21, 2010. Retrieved July 16, 2016. ^ "2017 Update" (PDF). cityarchriver.org. CityArchRiver Foundation. 2017. p. 2. Retrieved March 2, 2017. ^ Taketa, Kristen. "Timber! Most of St. Louis' 15,000 ash trees coming down to stop bug invasion". Retrieved August 26, 2016. ^ Moffitt, Kelly. "Planners hit fundraising goal for Arch grounds renovation". Retrieved June 21, 2017. ^ "President Donald J. Trump Signs S. 1438 into Law". White House. Richard I. Ortega (March 3, 1976). "National Register of Historic Places Places Inventory – Nomination Form: Jefferson National Expansion Memorial" (PDF). National Park Service. Retrieved January 19, 2016. Accompanying three photos from c. 1942 and 1975. "Jefferson National Expansion Memorial" (PDF). Missouri Department of Natural Resources. Retrieved May 30, 2008. Wikimedia Commons has media related to Gateway Arch National Park.